Collecting awards is always nice. It shows that the industries in which we operate recognise our hard work and ability. Plus, we get to enjoy an evening out. 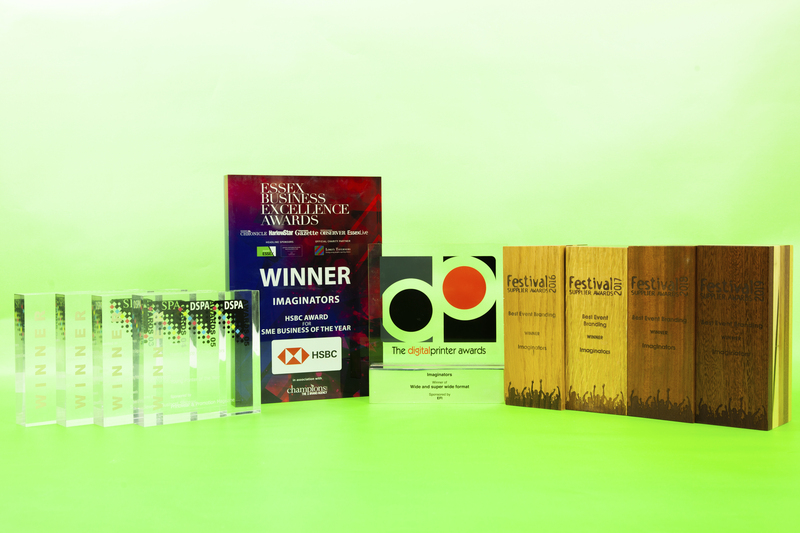 We’ve received multiple awards, including Best SME Business of the Year, Best Wide Format and Best Superwide Format Digital Print Company of the Year four times. In addition to being multiple winners of the Best Branding company at the Festival Supplier Awards for our services to the music and festival industry in 2016, 2017 and again in 2018. We’re also happy to have helped our dedicated team win Young Digital Printer of the Year. Imaginators found a solution to a time-sensitive production problem which had it not been achieved would have negatively impacted on the event aesthetic. Imaginators showcased innovative solutions and the next level of festival branding and project management. Judges felt that Imaginators was knowledgeable and experienced and demonstrated a real understanding of print production.